Nutella has made a recent buzz, telling people how to correctly pronounce the brand name on their FAQ page. NEW-tell-uh not NUT-ella? 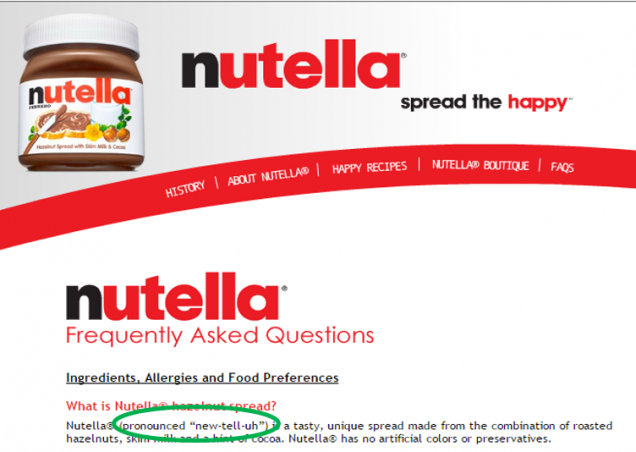 (http://www.nutellausa.com/faqs.htm) Confused? Let’s take a step back and understand where this brand is coming from. We all want to be called by our birth name and identify with it. Companies that have either gone global or are in the process of doing so feel the same way. By telling people how to correctly pronounce Nutella the famous Italian brand is certainly making a ‘faux-pas’ with their international marketing strategy. Though the intention of this entire episode was not to create a stir, the good news for Nutella is that they managed to create a buzz nonetheless. Historically, many brands have redeemed themselves after unintended backlash at international markets. (source) A successful international marketing strategy needs to be built based on the culture and understanding of new markets. So, feel free to call it “Nuttie,” “Oz spread” or “Nootella.” With 70% of the world’s GDP growth taking place in emerging markets from 2010-2013, effective international marketing strategy is the key to surviving in the global business market today. (source) Even for established firms, international marketing can be a tricky task, so think smart and get expert assistance to deal with customers overseas.